1D. Rafique (e-mail: DRafique@ADVAoptical.com) is with ADVA Optical Networking SE, Fraunhoeferstr. 9a, 82152 Munich, Germany. 2L. Velasco is with Universitat Politecnica de Catalunya, 08034 Barcelona, Spain. Networks are complex interacting systems involving cloud operations, core and metro transport, and mobile connectivity all the way to video streaming and similar user applications. With localized and highly engineered operational tools, it is typical of these networks to take days to weeks for any changes, upgrades, or service deployments to take effect. Machine learning, a sub-domain of artificial intelligence, is highly suitable for complex system representation. In this tutorial paper, we review several machine learning concepts tailored to the optical networking industry and discuss algorithm choices, data and model management strategies, and integration into existing network control and management tools. We then describe four networking case studies in detail, covering predictive maintenance, virtual network topology management, capacity optimization, and optical spectral analysis. A. Gupta and R. K. Jha, “A survey of 5G network: architecture and emerging technologies,” IEEE Access, vol. 3, pp. 1206–1232, 2015. V. Vusirikala, “A decade of software defined networking at Google,” in European Conf. Optical Communications, Sept. 2018. D. Rafique, H. Griesser, and J. P. Elbers, “Enabling 64Gbaud coherent optical transceivers,” in Optical Fiber Communications Conf. and Exhibition (OFC), Mar. 2017, pp. 1–3. V. Lopez, J. M. Gran, R. Jimenez, J. P. Fernandez-Palacios, D. Siracusa, F. Pederzolli, O. Gerstel, Y. Shikhmanter, J. Mårtensson, P. Sköldström, T. Szyrkowiec, M. Chamania, A. Autenrieth, I. Tomkos, and D. Klonidis, “The role of SDN in application centric IP and optical networks,” in European Conf. Networks and Communications (EuCNC), June 2016, pp. 138–142. M. Ruiz and L. Velasco, Provisioning, Recovery, and In Operation Planning in Elastic Optical Networks, Wiley, 2017. S. Russell and P. Norvig, Artificial Intelligence: A Modern Approach, 3rd ed. Upper Saddle River, NJ: Prentice Hall, 2009. R. O. Duda, P. E. Hart, and D. G. Stork, Pattern Classification, 2nd ed. New York, NY: Wiley, 2000. T. Hastie, R. Tibshirani, and J. Friedman, The Elements of Statistical Learning: Data Mining, Inference and Prediction, 2nd ed. Springer, 2009. D. Zibar, L. H. H. de Carvalho, M. Piels, A. Doberstein, J. Diniz, B. Nebendahl, C. Franciscangelis, J. Estaran, H. Haisch, N. G. Gonzalez, J. C. R. F. de Oliveira, and I. T. Monroy, “Application of machine learning techniques for amplitude and phase noise characterization,” J. Lightwave Technol., vol. 33, no. 7, pp. 1333–1343, Apr. 2015. Y. Huang, P. B. Cho, P. Samadi, and K. Bergman, “Dynamic power pre-adjustments with machine learning that mitigate EDFA excursions during defragmentation,” in Optical Fiber Communications Conf. and Exhibition (OFC), Mar. 2017, pp. 1–3. D. Rafique, T. Szyrkowiec, H. Grießer, A. Autenrieth, and J.-P. Elbers, “TSDN-enabled network assurance: a cognitive fault detection architecture,” in 43rd European Conf. Optical Communication (ECOC), 2017. D. Rafique, T. Szyrkowiec, H. Grießer, A. Autenrieth, and J.-P. Elbers, “Cognitive assurance architecture for optical network fault management,” J. Lightwave Technol., vol. 36, no. 7, pp. 1443–1450, Apr. 2018. A. P. Vela, B. Shariati, M. Ruiz, F. Cugini, A. Castro, H. Lu, R. Proietti, J. Comellas, P. Castoldi, S. J. B. Yoo, and L. Velasco, “Soft failure localization during commissioning testing and lightpath operation,” J. Opt. Commun. Netw., vol. 10, no. 1, pp. A27–A36, Jan. 2018. J. Mata, I. de Miguel, R. J. Durán, N. Merayo, S. K. Singh, A. Jukan, and M. Chamania, “Artificial intelligence (AI) methods in optical networks: a comprehensive survey,” Opt. Switching Netw., vol. 28, pp. 43–57, 2018. F. Musumeci, C. Rottondi, A. Nag, I. Macaluso, D. Zibar, M. Ruffini, and M. Tornatore, “A survey on application of machine learning techniques in optical networks,” arXiv:1803.07976, Mar. 2018. S. Marsland, Machine Learning: An Algorithmic Perspective, CRC Press, 2011. O. Chapelle, B. Schlkopf, and A. Zien, Semi-Supervised Learning, 1st ed. MIT, 2010. S. Shahkarami, F. Musumeci, F. Cugini, and M. Tornatore, “Machine-learning-based soft-failure detection and identification in optical networks,” in Optical Fiber Communication Conf., Optical Society of America, 2018, paper M3A.5. S. B. Kotsiantis, “Supervised machine learning: a review of classification techniques,” in Emerging Artificial Intelligence Applications in Computer Engineering—Real Word AI Systems with Applications in eHealth, HCI, Information Retrieval and Pervasive Technologies, IOS, 2007, pp. 3–24. Y. Bengio, “Learning deep architectures for AI,” Found. Trends Mach. Learn., vol. 2, no. 1, pp. 1–127, Jan. 2009. F. Morales, M. Ruiz, L. Gifre, L. M. Contreras, V. López, and L. Velasco, “Virtual network topology adaptability based on data analytics for traffic prediction,” J. Opt. Commun. Netw., vol. 9, no. 1, pp. A35–A45, Jan. 2017. S. G. Petridou, P. G. Sarigiannidis, G. I. Papadimitriou, and A. S. Pomportsis, “On the use of clustering algorithms for message scheduling in WDM star networks,” J. Lightwave Technol., vol. 26, no. 17, pp. 2999–3010, Sept. 2008. R. S. Sutton and A. G. Barto, Introduction to Reinforcement Learning, 1st ed. Cambridge, MA: MIT, 1998. C. J. C. H. Watkins and P. Dayan, “Q-learning,” Mach. Learn., vol. 8, no. 3, pp. 279–292, May 1992. Y. V. Kiran, T. Venkatesh, and C. S. R. Murthy, “A reinforcement learning framework for path selection and wavelength selection in optical burst switched networks,” IEEE J. Select Areas Commun., vol. 25, no. 9, pp. 18–26, Dec. 2007. S. Pandey, M.-J. Choi, Y. J. Won, and J. W.-K. Hong, “SNMP-based enterprise IP network topology discovery,” Int. J. Netw. Manage., vol. 21, no. 3, pp. 169–184, May 2011. “gRPC—An RPC library and framework,” GitHub. Inc, 2015 [Online]. Available: https://github.com/grpc/grpc . E. Wittern, J. Laredo, M. Vukovic, V. Muthusamy, and A. Slominski, “A graph-based data model for API ecosystem insights,” in IEEE Int. Conf. Web Services, June 2014, pp. 41–48. L. Velasco, L. M. Contreras, G. Ferraris, A. Stavdas, F. Cugini, M. Wiegand, and J. P. Fernandez-Palacios, “A service-oriented hybrid access network and clouds architecture,” IEEE Commun. Mag., vol. 53, no. 4, pp. 159–165, Apr. 2015. R. Casellas, R. Martínez, R. Vilalta, and R. Muñoz, “Control, management, and orchestration of optical networks: evolution, trends, and challenges,” J. Lightwave Technol., vol. 36, no. 7, pp. 1390–1402, Apr. 2018. L. Gifre, J.-L. Izquierdo-Zaragoza, M. Ruiz, and L. Velasco, “Autonomic disaggregated multilayer networking,” J. Opt. Commun. Netw., vol. 10, no. 5, pp. 482–492, May 2018. “TensorFlow–An open source machine learning framework for everyone,” GitHub. Inc, 2018 [Online]. Available: https://www.tensorflow.org/ . S. R. Tembo, S. Vaton, J. L. Courant, and S. Gosselin, “A tutorial on the EM algorithm for Bayesian networks: application to self-diagnosis of GPON-FTTH networks,” in Int. Wireless Communications and Mobile Computing Conf. (IWCMC), Sept. 2016, pp. 369–376. D. Rafique, T. Szyrkowiec, A. Autenrieth, and J.-P. Elbers, “Analytics-driven fault discovery and diagnosis for cognitive root cause analysis,” in Optical Fiber Communication Conf., Optical Society of America, 2018, paper W4F.6. F. E. Grubbs, “Sample criteria for testing outlying observations,” Annu. Math. Stat., vol. 21, no. 1, pp. 27–58, Mar. 1950. J. Paparrizos and L. Gravano, “k-shape: efficient and accurate clustering of time series,” SIGMOD Rec., vol. 45, no. 1, pp. 69–76, June 2016. A. P. Vela, M. Ruiz, F. Fresi, N. Sambo, F. Cugini, G. Meloni, L. Potì, L. Velasco, and P. Castoldi, “BER degradation detection and failure identification in elastic optical networks,” J. Lightwave Technol., vol. 35, no. 21, pp. 4595–4604, Nov. 2017. L. Barletta, A. Giusti, C. Rottondi, and M. Tornatore, “QoT estimation for unestablished lighpaths using machine learning,” in Optical Fiber Communications Conf. and Exhibition (OFC), Mar. 2017, pp. 1–3. T. Tanimura, T. Hoshida, T. Kato, S. Watanabe, and H. Morikawa, “Data analytics based optical performance monitoring technique for optical transport networks,” in Optical Fiber Communication Conf., Optical Society of America, 2018, paper Tu3E.3. D. Rafique, “Machine learning based optimal modulation format prediction for physical layer network planning,” in Int. Conf. 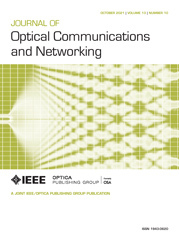 Transparent Optical Networks, IEEE, 2018, paper Tu.A3.5. P. Poggiolini, “The GN model of non-linear propagation in uncompensated coherent optical systems,” J. Lightwave Technol., vol. 30, no. 24, pp. 3857–3879, Dec. 2012. T. Rahman, A. Napoli, D. Rafique, B. Spinnler, M. Kuschnerov, I. Lobato, B. Clouet, M. Bohn, C. Okonkwo, and H. de Waardt, “On the mitigation of optical filtering penalties originating from ROADM cascade,” IEEE Photon. Technol. Lett., vol. 26, no. 2, pp. 154–157, Jan. 2014. D. Rafique and A. D. Ellis, “Nonlinear and ROADM induced penalties in 28 Gbaud dynamic optical mesh networks employing electronic signal processing,” Opt. Express, vol. 19, no. 18, pp. 16739–16748, Aug. 2011.
de Carvalho, L. H. H.
de Oliveira, J. C. R. F.
Watkins, C. J. C. H.
Fig. 1. Heterogeneous optical network architecture. Fig. 2. Machine learning model construction and test workflow. Fig. 3. ML families. The first box in each column identifies the main characterization of the ML approach; the second box identifies examples of algorithms used in the approach; and the third box indicates examples of applications that can take advantage of the approach. Fig. 4. Illustrative example of a dual-layer ANN architecture. Fig. 5. Underfitting versus overfitting. Fig. 6. k -fold cross-validation. Fig. 7. ROC- and AUC-based classifier evaluation. The dotted and dashed lines are examples of typical ROC curves; the classifier corresponding to the dashed line provides better performance. Fig. 8. Model-driven telemetry stack. REST, representational state transfer; RHU, remote hub unit; VNF, virtual network function. Fig. 9. Data storage and representation workflow and technologies. Fig. 10. Self-driven networking architecture. Fig. 11. Adaptive model update based on changing data profile, as opposed to fixed duration periodic updates. (a) Normal distribution of optical power levels. (b) Abnormal distribution of optical power levels. Fig. 12. Fault management functional hierarchy. Fig. 13. SDN-integrated fault discovery (detection) and diagnosis. (a) System-level FDD. (b) Node-level FDD. Fig. 14. (a) Localized fault discovery at the node. (b) Local feature similarity analysis for root cause analysis. Fig. 15. (a)–(c) Reactive and proactive adaptation. Numbers in the inset represent link capacity in gigabits per second (Gb/s). (d) Maximum prediction error versus days of monitoring. Fig. 16. (a) and (b) Prediction of min/max/avg for two different traffic profiles, and (c) ANN adaptation to smooth evolutionary bit rate. Fig. 17. Maximum used transponders versus load. Fig. 18. Network setup and ML input and output parameters. Fig. 19. (a) Classifiers’ performance. (b) Training time. Fig. 20. Example of optical spectrum and signal features. Fig. 21. Example of filter failures considered in this paper: (a) FS and (b) FT. Fig. 22. Workflow for filter failure detection and identification. Fig. 23. Accuracy of the proposed method for (a) FS and (b) FT identification.